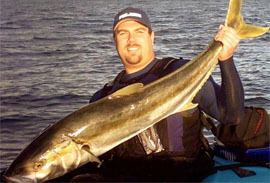 OEX now offers Intro to Kayak Fishing classes designed to introduce anglers to this exciting new style of fishing. The class consists of one seminar at our Mission Bay or Sunset Beach locations, where all aspects of kayak fishing will be discussed. 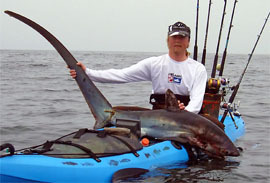 From basic fishing and paddling techniques to specialized kayak fishing methods, you will have the knowledge to have a safe and successful kayak fishing trip. The second part of the class is an instructional trip. Mission Bay classes take place at our location right behind the store in the Bay. Sunset Beach classes launch at Huntington Harbor. Bring your own kayak or use one of ours for no additional charge. You'll have the chance to use the skills you've learned in the seminar and apply them to the water. INCLUDED IN PRICE - Seminar, instructional trip, kayak and life Jacket (some restrictions apply). *Not included in price is fishing license.